Posted by themotochanneladmin & filed under Choppers. Hokan Martensson of Costa Mesa, California show us his beautifully restored custom 1956 Harley-Davidson FLE Panhead Chopper. 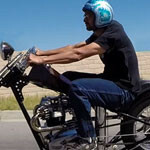 Duane Ballard of Duane Ballard Custom Leather in Lake Elsinore California shows us the far out Digger he built for Born Free 5 based on a 1981 Kawasaki police bike. Riding video shot with the GoPro Hero 3+. 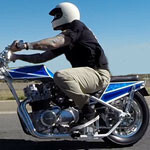 Alex Cardone of Lake Elsinore, California shows us his custom build that was awarded “Best Unit Triumph” at the Born Free 3 show in 2011. It is based on a 1963 Triumph T120 Bonneville. Riding video shot with the GoPro Hero 3+.